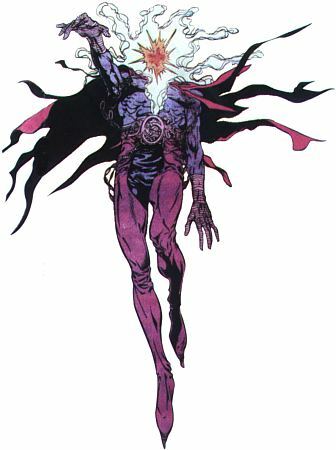 Magic: Dreamslayer is a powerful sorcerer that draws his power from the “dimension of terrors”. He has displayed the ability to teleport, read minds, manipulate matter, possess beings and fly. Invulnerability: Dreamslayer is a wraithlike being and is unlikely to be killed by conventional means. His original name is unknown but the man that would become Dreamslayer was a member of an ambitious group of five terrorists that attempted to steal an experimental megabomb on the planet Angor. When the bomb detonated accidentally, the men did not die; they were mutated into the most powerful beings on the planet Angor and formed the Extremists. As Dreamslayer he led the Extremists, who triggered a nuclear holocaust on the planet Angor. He survived by taking refuge in the “dimension of terror” from which he drew his powers. He returned to Angor to discover his comrades had been killed but were remade as androids. Dreamslayer led the robotic Extremists to Earth in an attempt to conquer it.